Agricultural Economic Insights Will Farm Income Fall in 2016? U.S. farm income has fallen sharply in the last two years. One of the key questions facing agriculture is whether farm income will decline for a third straight year. Below we offer our perspective on this question. Net farm income for the farm sector is shown in figure 1. We have discussed this chart on several occasions. First, pointing out how high the incomes were in the early 2010’s, then more recently pointing to the magnitude of the farm income declines. In percentage terms, the decline from 2014 to 2015 is the largest since the 42% decline from 1982 to 1983. Another decline would put real farm income below the lower 1 standard deviation band shown on Figure 1. This would be the first time that this measure has fallen to that level since 2002. Figure 1. Real (2009 USD) Net Farm Income, U.S. 1929-2015f. The question of whether income will fall again this year is dependent upon the extent to which economic and production conditions for the various commodity groups in the farm sector improve or deteriorate. The share of cash receipts accounted for by each commodity group are shown in figure 2. If you examine this figure, just short of half of the cash receipts come from livestock related commodities (the right half of the pie) and the other half come from crops. Within these broad categories cattle and calves are the largest livestock category and corn is the largest crop enterprise. In 2015 the combination of corn and soybeans were roughly equal to the receipts from cattle and calves. Clearly, if farm income is to improve in 2016 it would be a big boost if these large commodity groups had a good year. Figure 2. 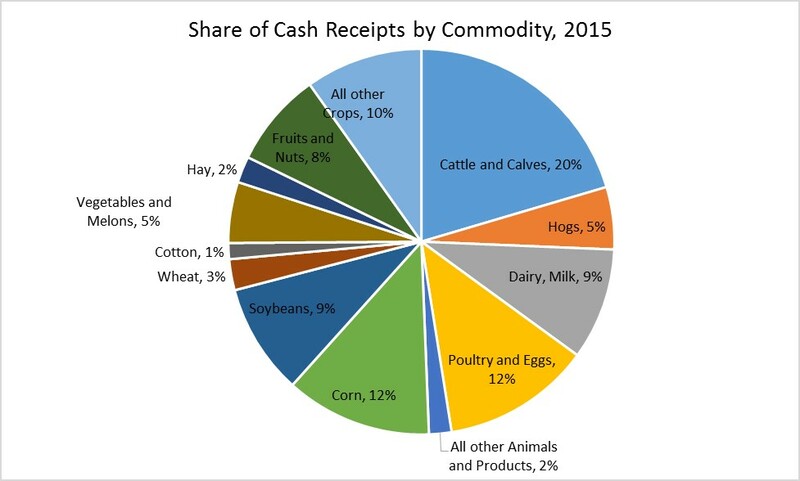 Share of Cash Receipts by Commodity, 2015. The change in 2014 to 2015 cash receipts for each commodity group is shown in Figure 3. Several commodities had a rough 2015. The declines were greater than 15% for hogs, dairy, corn, soybeans, wheat and cotton. Only 4 groups experienced increases, and the increases were all less than 5%. The changes in cash receipts can be a function of price and quantity changes. As this graphic from the Economic Research Service indicates, in 2015 nearly all of the decline was a result of price declines. Figure 3. Percentage Change in Cash Receipts from 2014-2015. As we think about 2016 it will be important to see if the price declines in these various sectors have stabilized or continue to decline. To get a sense for the big picture, monthly price indices for all crop and all livestock products are shown in figure 4. 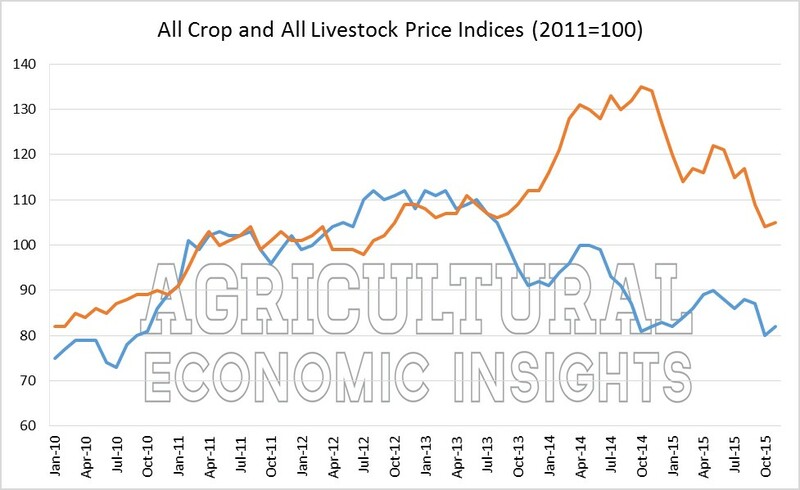 These indices highlight the large price declines that occurred for both crops and livestock in general. Figure 4. Monthly Indexes of Prices Received for Crops and Livestock (2011 base), 2010-2015. Source USDA National Agricultural Statistics Service. If one examines livestock prices some interesting things emerge. In 2014 livestock prices increased through the first half of the year and then fell in the second half, ending the year close to where they started. In 2015 they initially climbed, but then started falling mid-year and ended the year well below where they started. Specifically, the livestock price index peaked at 122 in May, but remained above 114 through all months until September. By November, it had fallen to 105, a 14% decline from its peak. When thinking about 2016 net farm income levels relative to 2015 this is likely important. In the livestock sector, roughly 75% of 2015 was spent at price levels well above those found today. Unless prices recover substantially, 2016 livestock cash receipts will struggle to match last year’s. Given that livestock account for roughly half of the income in the sector, price recovery on the livestock side will be key to keeping 2016 sector income from falling yet again. On the crop side a similar, but less dramatic story emerges. For instance, the crop price index peaked at 90 in May and had fallen 9% to 82 by the end of the year. In the case of crops, current prices are close to where they were at the start of 2015. Here, the price increases that would be required to match last year’s price levels are less than in the case of livestock. To further illustrate the price changes for the various commodities we have listed several commodities, their prices as reported by USDA of November 2014, June 2015, and November 2015, and the percentage changes. The extent to which prices declined from 2014 to 2015 is readily apparent. Of these commodities only one, eggs, registered a gain over the last year. Of the rest, corn actually turned in the best performance holding its November 2014 level. The price changes in the last 6 months show that many of the price declines continued in the second half of the year. For instance, from June to November beef and hogs lost 17% and 23%, respectively. Broilers declined a massive 32% from June 2015 to today. The declines in U.S. net farm income have been significant and widespread and many are wondering whether they will continue. As the USDA pointed out, the declines in income from 2014 to 2015 were largely due to declines in commodity prices. When looking at the prospects for a rebound in 2016 one must look at the extent to which different commodity groups contribute to net cash income. Livestock accounts for nearly half of agricultural cash receipts and these industries will play a key role in whether income declines again. Given that prices remained high for many livestock commodities through the first half of 2015, significantly higher livestock prices would be required in order for 2016 livestock receipts to match or exceed 2015. On the other hand, most of the crop commodities would not require as much price improvement to match or exceed 2015 levels. While we didn’t consider costs, the news there appears to be better than in the last few years with costs starting to moderate. In total, significant price recovery in livestock or a broad based increase in crops would likely be required for 2016 income to rise above 2015. While we wouldn’t rule that out, it is also possible that prices could decline further. If so, incomes would almost certainly fall again.